Hermèsmatic, a playful standalone concept designed to breathe new life into pre-loved Hermès silk scarves will make its UK debut in Manchester this October 2017. 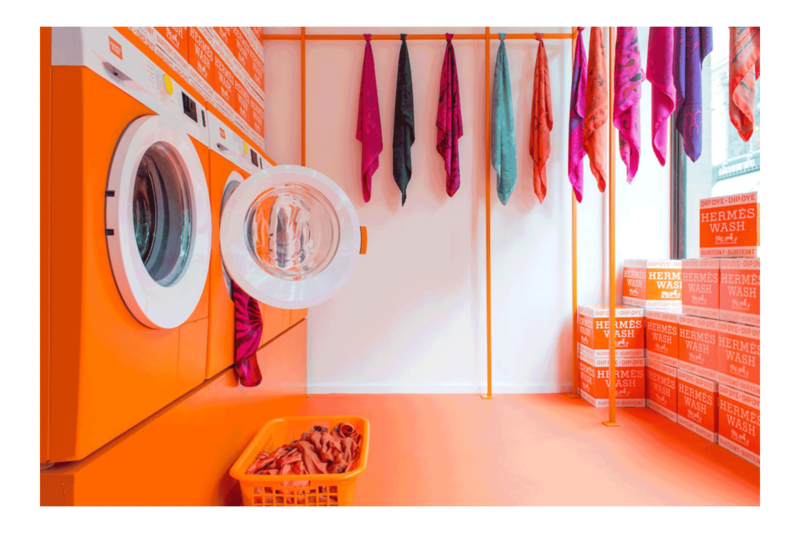 This fun and interactive experience gives you the chance to fall in love with your Hermès silk scarves all over again through a rejuvenating dip-dye in the Hermèsmatic washing machines. Simply bring your scarf to the Hermèsmatic launderette on Manchester’s King Street and select from a choice of vibrant colours – denim blue, fuchsia pink and bright red. Then watch as your scarf is transformed by the vivid and colourful dye bursting onto the print, as each scarf takes a mesmerising waltz within the orange machines. Next our tumble dryer imbues the scarf with a soft and sumptuous vintage-scarf feel, ready for collection at the Hermès store within Selfridges Exchange Square. Coming to the UK for the first time, after a colourful voyage around the world, Hermèsmatic is open to everyone and offers a chance to discover the wonderful world of Hermès silk. From Thursday, 5th October for 7 days, the launderette will also play host to Hermès silk styling workshops, where our specially trained stylists will dip into the Hermès scarf collections and show you a myriad of ways to wear an Hermès scarf. Herme?smatic will open from Thursday, 5th October 2017 to Thursday, 12th October 2017 at 31 King Street, Manchester having previously appeared in Paris, New York, Kyoto and Dubai.